Prevent Child Abuse America | Find out how you can help prevent child abuse by reaching out and supporting hurting children. The American Humane Society | We tend to think of the American Humane Society as mostly animal-focused, but the organization has fantastic information about child abuse prevention and how we can help children. Child Welfare Information Gateway | Download the free ebook Preventing Child Maltreatment and Promoting Well-Being: A Network for Action 2013 Resource Guide. It supports service providers in their work with parents, caregivers, and their children to strengthen families and prevent child abuse and neglect. It focuses on the six protective factors, which have been proven to reduce the risk of abuse and neglect, and provides tools and strategies to integrate the protective factors into existing programs and systems. Healing the Scars of Emotional Abuse | In this fantastic book, Dr. Gregory L. Jantz with Ann McMurray, explores the subject of emotional child abuse in all its forms, including verbal, actions, and indifference. The author also offers strategies for dealing with abusers, self-check quizzes, stories from survivors, and a Scriptural plan for healing. Boundaries: When to Say Yes, How to Say No and Take Control of Your Life [Book] | Dr. Henry Cloud and John Townsend, clinical psychologists, discuss the severe impact of being raised without boundaries and its effects into adulthood. They also offer Bible-based answers to tough issues about setting boundaries with parents, spouses, children, friends, co-workers, and ourselves. Plus, they tackle the alleged Bible-based arguments abusers make to convince the abused to continue to allow it to happen. The Drama of the Gifted Child | Polish psychologist Dr. Alice Miller examines the consequences of repression at the personal and social level, the causes of the physical and psychological harm done to children and how this can be prevented, and finally the new methods at our disposal for dealing with the consequences of infant traumas. “You Carry the Cure in Your Own Heart” [Essay] | Child protection attorney and child advocate Andrew Vachss wrote this brilliant essay about the truth of emotional child abuse and its long-lasting effects into the abused child’s adulthood. Psychology Today: The Narcissistic Family Portrait [Article] | Dr. Karyl McBride, Ph.D., L.M.F.T., wrote an article about the narcissistic family’s “dirty little secret.”She specializes in treating clients with dysfunctional family issues. Luke 17:3 Ministries [Website] | This ministry specifically sets out to educate and empower adults who have been emotionally abused as children and continue to be as adults. The ministry offers articles, tips, and, in some cases, empathy for those who have been abused… and offers suggestions for breaking the cycle. Resources for Adult Children of Narcissistic Parents | The website is a personal blog but packed with information about growing up with NPD parents. Web of Narcissism | Online forum with boards for people dealing with loved ones with NPD; online resources for learning more about NPD; etc. I figured it out reading “The Wizard of Oz and Other Narcissists” by Eleanor Payton. I highly recommend it. Any recommended reading for adult children of parents with Borderline Personality Disorder? People with untreated BPD are often notoriously emotionally abusive. My therapist gave me a book called “Understanding the Borderline Mother” by Christine Ann Lawson. 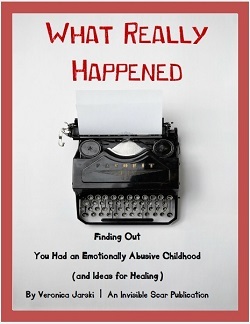 (http://www.amazon.ca/Understanding-Borderline-Mother-Unpredictable-Relationship/dp/0765703319) I wasn’t sure what had happened in my childhood until I read this book. My siblings have all read it and we refer to it as “the bible”. I highly recommend picking up this book if you have a borderline mother. Don’t know if you’re still out there, but there’s a book called “Stop Walking on Eggshells” that I found extremely helpful. I have found this book is so valuable when “interviewing” possible therapists. I have had far too many therapists tell me that I am either crazy, gotta get over it, it doesn’t exist, or some just don’t understand and do more damage than they ever do to help. I always thought that Doctors are supposed to take the oath, of ‘Do no harm’. My last therapist I had for a month. He told me that my issues weren’t quantifiable, therefore, they didn’t exist. I only attended 3 meeting total, with that idiot. I also like M. Scott Peck, “People of the Lie” the first introductory venture into the study of human evil. The premise here is that , when someone kills a child’s spirit, they are essentially murdering the child. (not in literal terms, but in the sense that once a spirit has been squashed, it could be the end of the child’s dreams, aspirations, etc,. ) I am saddened that to this day, there are so few therapists and doctors that truly understand and want to help in assisting someone to get past their abusive childhood and to move forward in life. Too many times today, all the medical profession wants to do is to write a prescription. No understanding, no empathy, and surely no progression. I find Alice Miller’s work very dense, because she is so intelligent and thorough, but her books have helped me make leaps and bounds toward mental health! Thank you the talent behind that compassionate soul for lighting up my path & lightening my burden. As a kid I have memories of a cold and distant person that was constantly demanding me to talk to her about everything and anything in my life but she did not divulge ANYTHING about herself. I would describe my mother as prim proper classy snobby always had to be right, but everyone loves my mom. she was and still is the most popular person anywhere she would go… she is the head of every club and is very quiet and dignified. She does everything right (seriously) no I’m serious and she just could not fathom why i was not just like her. She told me how to act, table manners, etiquette, respectful to elders but if I was “myself” everything I did that did not conform to her standards of proper manners and excellent school work then I was “difficult” She always told me that I needed to change. She would say I didn’t have friends because I refused to fit in and do what everyone else wanted. She made me feel strange and odd. If she was angry with me she could go several days without speaking to me. She would wait to tell me why she was upset.. made me so anxious always waiting to hear the infraction and disappointing I was. However I was given a beautiful things and lovely home and clothes. The things were always purchased with reminders that she bought them so she could tell me how to use them (I remember a specific winter coat incident) and she never failed to remind me that I didn’t deserve the gift but because she loved me so much …. she was giving it to me anyway. We traveled as a family ALL THE TIME. I didn’t do any real activities with kids and I wasn’t allowed to just go out an play unless the parent of the children called my mom and invited me. That never happened because kids were just supposed to go hang out back then. My mother was cold always put her arms up when dad went to hug her. She was always telling us how much we hurt her and how she was unappreciated. She was sad a great deal and definitely not approachable. She didn’t like anything about me unless it fit her picture of what a proper, respectful child was supposed to be. She was a master manipulator of guilt. She still does it now. I am her caregiver now because there is noone else. My dad died in 99 and all the happiness and love and warmth vanished from our lives. Dad was the kind, sweet, romantic provider. He and mom would use me to play see she loves me more way more than I really want to think about. It gave me a powerful feeling but also it was just so manipulative. She now lives with me and after a bout with cancer this year she refuses to take care of herself, eat or drink and then when I get upset about her lack of effort she puts this sugary sweet voice on and a pained look on her face and says “Oh if only I wasn’t such a burden” Or I’m so sorry I cause you so much trouble… but she refuses to do anything for herself she expects to be waited on hand and foot. So, I don’t know if she fits under any specific mental health category but I need help. I am a mess and my children are suffering and things are spinning out of control. I also should add that I am adopted my birth mother rejected me at birth and in my 40’s when I found her doing a search. So I have a lot of rejection and feelings of worthlessness If you could suggest some places to start and maybe help figuring out what possibly mentally is going on… she doesn’t incessantly talk about herself at all she is VERY private. So I don’t know about narcississtic… but she is extremely self centered and if it doesn’t fit into her reality then it just isn’t so. I am looking for some insight. Hi, I’m currently going through a toxic relationship with my narcissistic grandmother. I can’t attest to much but are you able to put your mother in respite care? It would relieve the burden off of your shoulders somewhat. Do you live in America? I’m not too sure how it would work there.